Hanford will need about $3.6 billion in fiscal 2016 to meet its legal obligations for environmental cleanup, officials said Wednesday at the annual Hanford budget meeting in Richland. That's $1.5 billion more than the Obama administration has proposed for fiscal 2015 and still could not be enough to meet legal obligations. Department of Energy Hanford officials based their projection for fiscal 2016 on DOE's proposal to amend the court-enforced consent decree that sets some deadlines for retrieving radioactive waste from leak-prone underground tanks and treating the waste for disposal at the vitrification plant. The state's proposal to amend the consent decree is more aggressive and could add $300 million more to annual budgets, according to an early estimate by the Tri-City Development Council. That increase does not include the state's request for eight new double-shell waste storage tanks to securely hold high-level radioactive waste, which could add hundreds of millions more. Ten deadlines under the legally binding Tri-Party Agreement already are projected to be missed elsewhere at Hanford by the end of fiscal 2015, according to DOE. Most of those deadlines will be missed because work fell behind when Congress failed to pass an annual budget and because of sequestration, or forced federal budget cuts, said Jon Peschong, deputy assistant manager for cleanup at the DOE Hanford Richland Operations Office. Those include six deadlines requiring plans to be made for cleanup projects, a pacing deadline toward getting the Plutonium Finishing Plant demolished and a deadline to start removing radioactive sludge from the K West Basin by September. The remaining two deadlines, both for September 2015, are the result of lack of funds. They include retrieving temporarily buried waste that may be sent to the Waste Isolation Pilot Plant, a national waste repository in New Mexico, and getting some waste ready to be shipped to the repository. The administration's budget proposal for fiscal 2015 does not cover that work. In addition, the repository has been closed after a radiation incident earlier this year. Hanford is not going to get $3.6 billion in fiscal 2016, said Dave Einan of the Environmental Protection Agency, a Hanford regulator. "We're going to have to prioritize," he said. However, the state will not accept lack of money as a reason for not doing required work, said John Price of the Washington State Department of Ecology, also a Hanford regulator. The Tri-Party Agreement requires DOE to request enough money to do legally required work. About 40 percent of the DOE environmental cleanup budget already goes to Hanford, pointed out Roy Gephart, a retired scientist. The Western Governors' Association has recognized that issue and has asked that enough money be budgeted to meet cleanup obligations at all major DOE sites, Price said. Not only would the Hanford budget increase to meet obligations, but other cleanup sites also would receive more federal money under the association's request. The fiscal 2016 budget proposal includes an increase in spending from the $545 million in the administration's budget request for Hanford tank farms in fiscal 2015 to $961.3 million. Money for the Hanford vitrification plant would increase from $690 million to $970.6 million. That would bring the total budget request for those projects to almost $2 billion. In recent years the total budget for all Hanford work has been a little more than $2 billion. DOE plans to complete emptying all 16 tanks in the C Tank Farm in fiscal 2015 and prepare to start retrieving waste from the single-shell tanks in the A and AX Tank Farms, said JD Dowell, deputy manager of the DOE Hanford Office of River Protection. Work also would start under the tank farms budget toward a preliminary design of a Low Activity Waste Pretreatment System. DOE has proposed the new facility be built to allow some liquid tank waste be pretreated before being sent to the vitrification plant while technical issues are being resolved at the vit plant's Pretreatment Facility. The waste would go directly to the plant's Low Activity Waste Facility to be treated for disposal. DOE expects the new pretreatment system outside the vit plant to cost $245 million to $375 million to complete. Also in fiscal 2015, construction of the vit plant's Standby Diesel Generator Facility and Anhydrous Ammonia Facility should be completed. In fiscal 2016, DOE expects to start the conceptual design of a new Tank Waste Characterization and Staging Facility outside the vit plant to prepare waste for treatment. The cost would be included in the tank farm budget. It would reduce the size of some large and dense particles of waste that could be problematic for the vit plant and also blend and mix waste so solids stay suspended and a uniform mixture is available for sampling and transferring to the vit plant. Total cost is estimated at $345 million to $685 million. At the vitrification plant, work to construct the Low Activity Waste Facility would be completed in 2016, other than work needed to feed waste to it directly from the tank farms. For other work at Hanford under the Richland Operations Office the fiscal 2016 budget is proposed to be almost $1.8 billion, up from $1 billion being spent this year. Among the increases would be $81 million to treat radioactive sludge stored in the K West Basin. Work to retrieve and prepare temporarily buried waste for shipment to New Mexico would require a $329 million increase. Work to treat groundwater would increase from $116 million proposed for next year to $309 million. 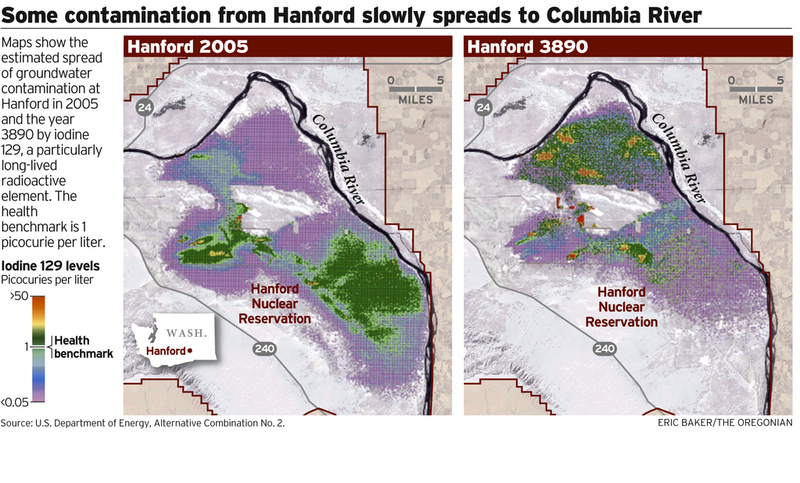 The budget for building demolition in central Hanford would increase by nearly $200 million. Planned work includes starting removal of the 618-10 burial ground's vertical pipe units in fiscal 2015. In fiscal 2016 work would start on the 618-11 burial ground, a similar high risk burial ground near Energy Northwest's commercial nuclear plant. DOE also is proposing placing a higher priority on moving cesium and strontium capsules from an underwater basin to dry storage. The capsules have the highest concentration of radioactivity in the United States, Peschong said, and the underwater basin is at risk in a severe earthquake. In fiscal 2016, DOE would spend $9 million to improve the ventilation system where the capsules are stored. The system, which is twice as old as it was designed for, must be improved to move the capsules to dry storage, Peschong said. Moving the capsules is estimated to cost $100 million to $120 million. Hanford's proposed fiscal 2016 budget will be sent to Washington, D.C., to be considered for the administration's fiscal 2016 budget proposal that should be released in early 2015. Comments on the proposed budget are due June 13 and may be sent to HanfordBudget2016@rl.gov or Department of Energy; Attn: 2016 Budget; P.O. Box 550, A7-75; Richland, WA 99352.